BBC SPORT | Football | Is Spanish football racist? In the wake of racist abuse suffered by England stars against Spain in November, BBC Sport tries to assess whether this was an isolated incident or typical of a more underlying social problem in Spanish football. 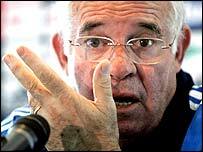 Spanish football has been in the spotlight since Spain coach Luis Aragones reportedly made racist comments about Arsenal striker Thierry Henry. 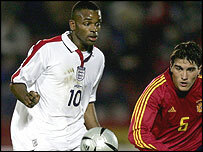 And the situation worsened when black players on England's senior and Under-21 teams were subjected to racist taunts during friendlies. Now Fifa has fined the Spanish Football Federation £44,750. But is this the end of the matter, or does Spanish football have a deep, social problem to overcome? Carlos Ferreyra Nunez, co-ordinator of Spain's United Against Racism group, believes the problem is widespread. "Racism is a cancer that has touched every aspect of football," he told BBC Sport, adding that racist behaviour could be seen "every week and all over the country". Nunez accused domestic managers of fuelling the problem by giving tickets to passionate "ultra right-wing" fans. And he also claimed that even the best-known black players in the Spanish top-flight are exposed to racism on a regular basis, even if they are reluctant to talk about it. Nunez asked the Spanish FA - which was at the time unavailable to comment on the state of its domestic football - to issue a final warning to Aragones. Meanwhile, Piara Power, spokesman for the British-based Kick It Out campaign, drew a direct parallel between the incidents at the two internationals and Aragones' attitude. "What's happened is quite complex but it's from the same set of values," he said. "Here in Britain the press would probably be leading the charge for his head." Barcelona-based BBC World Service reporter Alex Simpson said the coach had shown "some contrition" during an interview. Although he believes the current situation may have been inflamed by Aragones' confrontational interview technique, Simpson agrees that racial abuse is commonplace in Spain. "I have heard monkey chants at many games, but the Under-21 incident is the first time it has really been made into an issue," he said. "To an extent, the anti-racism publicity may disappear when the England team fly home. "But this may be the first step in an education process for Spanish football and it has definitely been an eye-opener." Nunez certainly aims to make sure the racism debate does not die down. He plans to keep piling pressure on the Spanish media - who he accuses of generally sidestepping the racism issue - and on the Spanish FA. Meanwhile, the modest fine given to the Spanish FA will have a deeper psychological impact than a financial one. It confirms that national football organisations will continue to be held responsible for the actions of their fans, boosting Nunez's campaign and those of all anti-racism bodies.